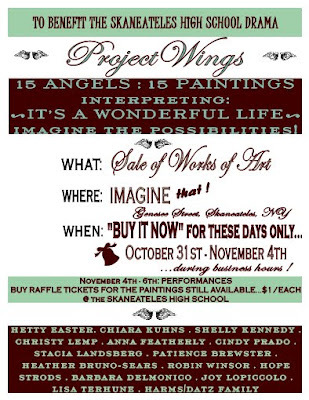 15 Angels (or artists) have painted beautiful works of arts to benefit the Skaneateles Drama club. We have collected the art, will display them at Imagine/Imagine that! from Halloween to November 4th, where they will be moved to the Skaneateles High School to display. Now here is the little tid-bit that might help you. At the performances you can buy as many raffle tickets for $1 each and bid on each painting you fancy, BUT if you really love one (you can also view them on the Skaneateles High school drama facebook page) you can have the option to "Buy it now!" at Imagine during those few days. Only there can you "buy it now", after they are moved and people start buying raffle tickets to win it, it is only fair to call the "buy it now" option, off!